Miss America 2019 contestants take the stage at Boardwalk Hall in Atlantic City, N.J., Sept. 9, 2018. 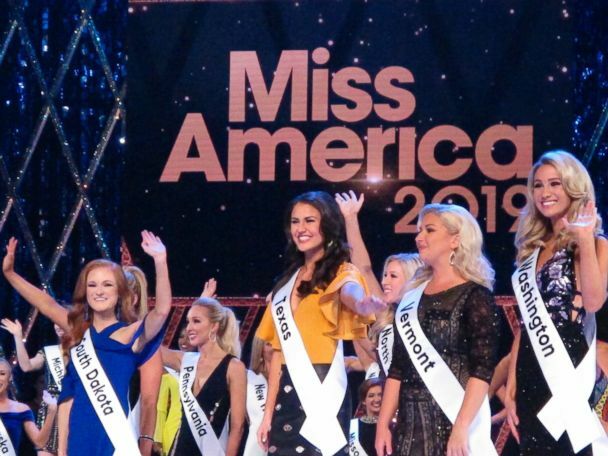 Ross Matthews introduces the formal wear competition during the Miss America pageant, Sunday, Sept. 9, 2018, in Atlantic City, N.J.
Miss Nebraska Jessica Shultis reacts as she makes the top 10 during the Miss America 2019 pageant at Boardwalk Hall in Atlantic City, N.J., Sept. 9, 2018. Miss Louisiana Holli Conway shares a kiss with another contestant as she is chosen to be in the top 10 during the Miss America 2019 show at Boardwalk Hall, in Atlantic City, N.J., Sept 9, 2018. 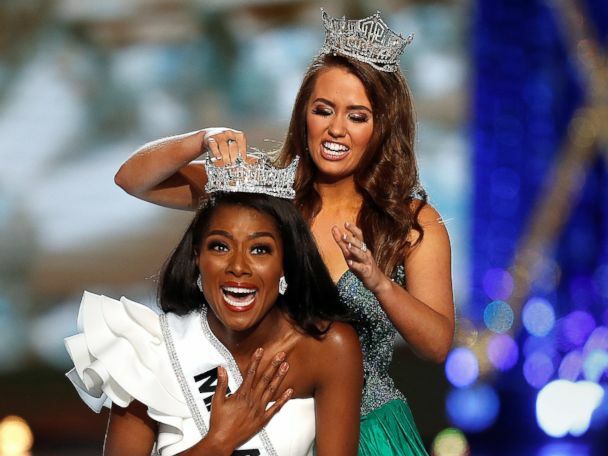 Miss New York Nia Franklin asks Miss Colorado Ellery Jones a question during the first interview portion at the Miss America pageant, Sept. 9, 2018, in Atlantic City, N.J.
Miss Colorado Ellery Jones asks Miss Alabama Callie Walker a question during the first interview portion at the Miss America pageant, Sept. 9, 2018, in Atlantic City, N.J.
Miss Florida Taylor Tynson asks Miss Nebraska Jessica Shultis a question during the first interview portion at the Miss America pageant, Sept. 9, 2018, in Atlantic City, N.J.
Miss Louisiana Holli Conway performs during the talent competition at the Miss America pageant, Sept. 9, 2018, in Atlantic City, N.J.
Miss New York Nia Franklin competes during the talent competition at the Miss America 2019 pageant, Sept. 9, 2018, in Atlantic City, N.J.
Miss Florida Taylor Tyson performs during the talent competition at the Miss America pageant, Sept. 9, 2018, in Atlantic City, N.J.
Miss Connecticut Bridget Mary Oei performs during the talent competition at the Miss America pageant, Sept. 9, 2018, in Atlantic City, N.J.
Miss New York Nia Franklin listens to the judges' question, while the other final four finalists stand behind her, during the last interview portion at the Miss America pageant, Sept. 9, 2018, in Atlantic City, N.J.
First runner-up Miss Connecticut Bridget Mary Oei hugs Miss New York Nia Franklin, as she is named Miss America, at the Miss America pageant, Sept. 9, 2018, in Atlantic City, N.J.
Miss New York Nia Franklin reacts after being named Miss America 2019, Sept. 9, 2018, in Atlantic City, N.J.
Miss New York Nia Franklin waves to the audience after winning the Miss America 2019 pageant in Atlantic City, N.J., Sept. 9, 2018. 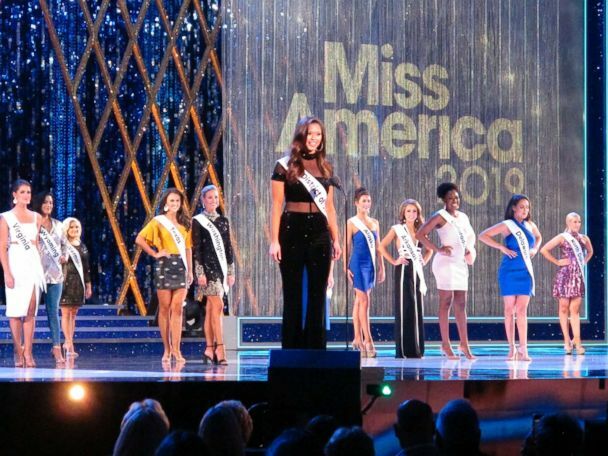 The revamped Miss America 2.0 took place tonight in Atlantic City.